The yarn is on the shelves! Admittedly, it's not exactly all cataloged on Ravelry yet, but a lot of it is, and I have been able to reclaim my dining table. 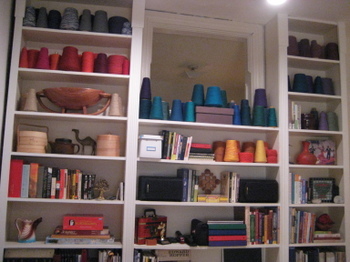 Neutral yarns were boxed up and stored in closets, anything with color is out on the upper shelves of my bookcases. It makes for a striking display, if I do say so myself. Thanks to all of you who gave advice and offered encouragement in this endeavor! That's gorgeous, lady! Even though I know how much was there, it's still kind of overwhelming to see it all like that. Amazing. It looks really great. What a fun way to show off your stash. I love a well organized book shelf and this is definitely a great way to display your yarns. Bravo!